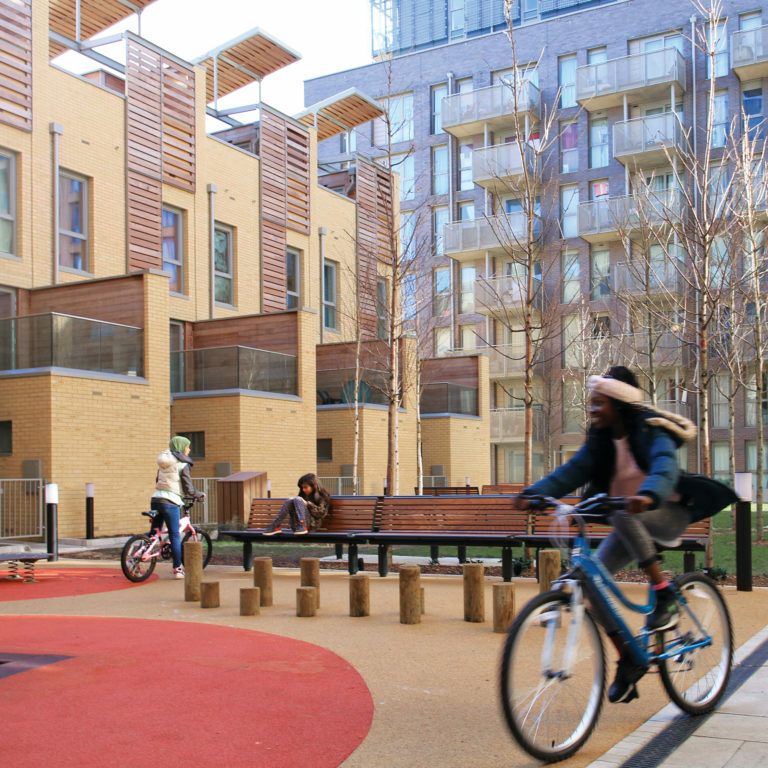 Our contextual and community-led approach to design and our commitment to placemaking is exemplified at Renaissance, a development that has transformed a run-down housing estate into a vibrant community that delivers high-quality homes and sustainable living. By collaborating with Barratt London, the London Borough of Lewisham and L&Q, Renaissance, comprising 795 private and affordable homes alongside a state-of-the-art leisure centre, new facilities for the London City Mission and a wide range of commercial space, was one of the first large developments in Lewisham Town Centre and has contributed to its regeneration. 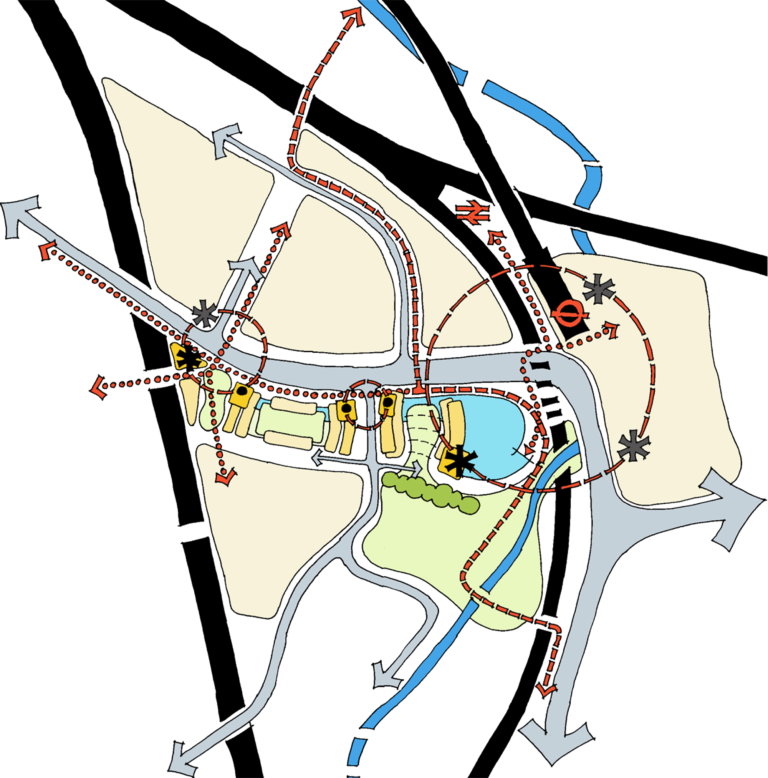 The site layout, grouping and landscaping were all designed to improve connections through the site and beyond, fully integrating the project into recent and future public realm improvements and developments. The eight main buildings range in height from five to 24 storeys and each have an architectural distinctness that responds to their immediate context, mediating between the terraced houses to the west with lower rise brick buildings and the Town Centre to the east with landmark towers. Key to the development is the number of three and four bedroom apartments and townhouses aimed at families. These include the eleven townhouses at the heart of the development which meet Code for Sustainable Homes Level 6 and form a low-density, green square among the high-density tall buildings and civic-feel of the rest of the masterplan. Their design was determined by energy efficiency and recyclability, creating not only a zero-carbon community, but also affordable living through low-energy bills. Sustainability measures include high thermal and acoustic performance of the building envelope, responsibly sourced materials, distinctive rooftop photovoltaics for renewable energy, grey water harvesting to reduce water use and a community garden with planters for ‘home growing’ of herbs and vegetables. 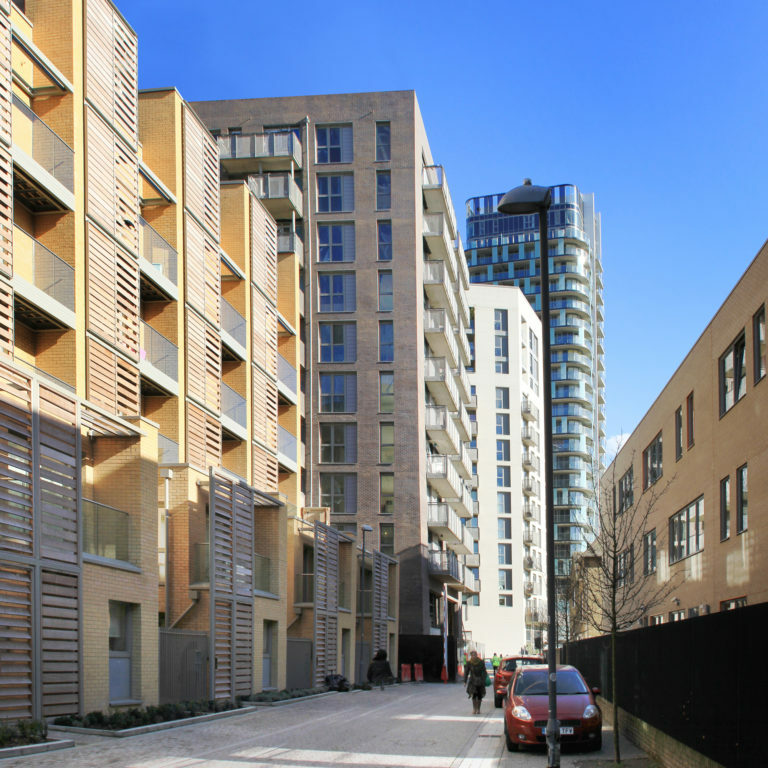 These townhouses are complemented by Renaissance’s on-site energy centre which contains a CHP system with biomass and gas boilers to generate enough energy for the heating and hot water requirements of all homes, the leisure centre, London City Mission, and the adjacent school. The brief was to transform the site into an environmentally sustainable community, focused on people. We consulted with the local community and worked closely with placemaking consultants Futurecity from concept stage to create a cultural identity for the area and ensure the provision of suitable uses and community facilities. This include two urban event spaces and the commissioning of artwork embedded into the architecture, such as the striking façade of the leisure centre by local artist Phil Coy. 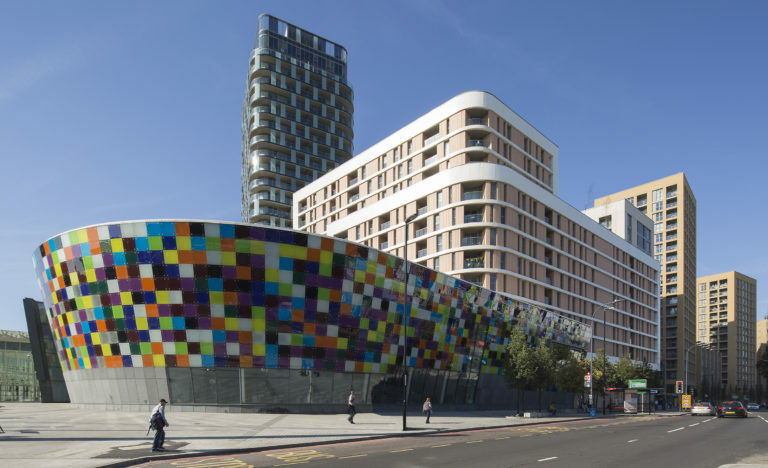 Entitled Razzle Dazzle, the facade comprises 1,400 colour glass panels, backed by LEDs which reflect and respond to the soundscape of Lewisham, representing in light and colour the living sounds of the community it serves. 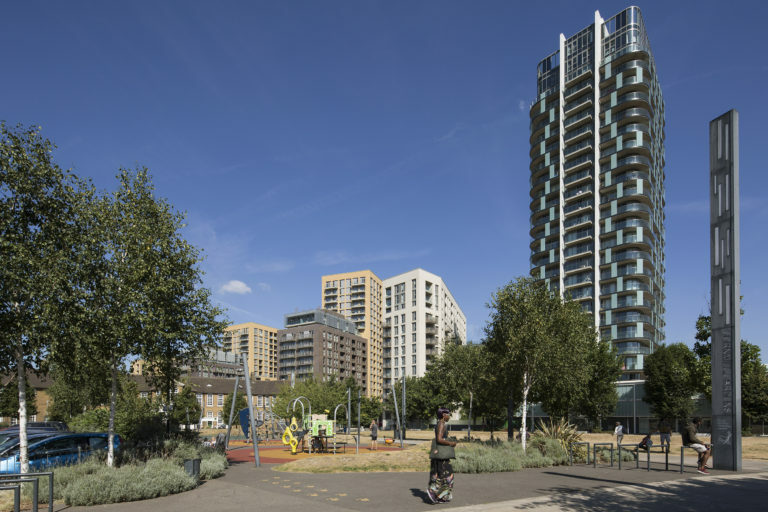 The completed development promotes health, fitness and wellbeing through the complementary mix of uses, transportation, landscape, building form and design, and has attracted investment and footfall to this new place.